Dublin is a crowd pleaser when it comes to weekend breaks – it’s great value, architecturally beautiful and astonishingly good fun. Whether you’re looking to soak up the local culture, explore the fantastic selection of eateries and restaurants or want to catch a breath of fresh air by the sea, the Irish capital has it all. Choosing the perfect location for a weekend break can be hard. When you start juggling travel time, convenience and cost amongst other things, you can pretty quickly kill the magic by picking a location just because its practical. Fortunately, I think I’ve found the answer to the question “Where’s fun and easy to visit in a weekend?”. It’s Dublin. A compact city packed full of culture, good craic and glorious architecture: it’s also less than an hours flight from London. There’s a plethora of airlines flying daily to the Irish capital from airports across the UK and Europe – and you’re right in the thick of things as soon as you arrive. With no long transfers or complicated transport networks to negotiate, you can crack straight on with the job of enjoying yourself. We headed across the Irish Sea for a long weekend at the end of February and surprised ourselves with how much fun (and good food) you can squeeze into three days. So, jump on board with my city guide as I show you how to spend 48 hours on the Emerald Isle – where to go, what to do and what to eat in Dublin. 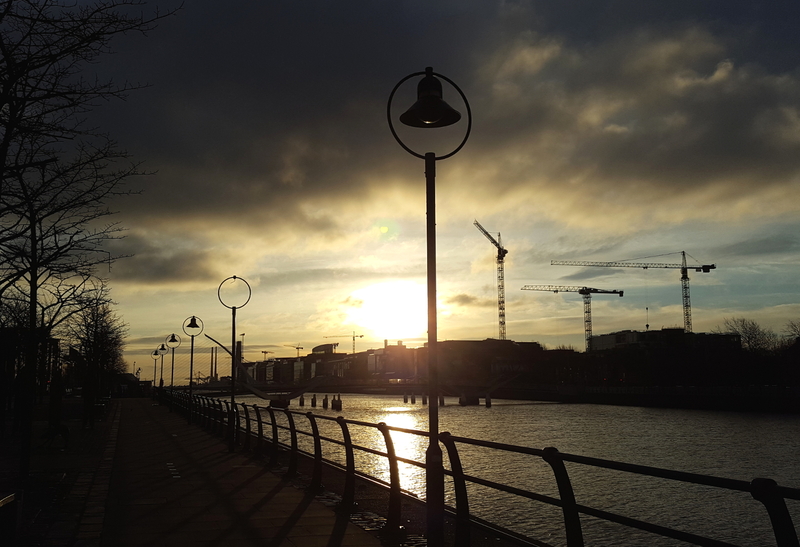 We spent our first day getting to know central Dublin, and the banks of the river Liffey. After checking into our hotel we crossed the Ha’Penny bridge (a pretty wrought iron number that is one of several pedestrian bridges spanning the river) and headed to Temple Bar. It’s a good place to start exploring, with inviting cobbled streets and bustling venues whatever time of day you arrive. Ignore it’s reputation as party central (unless you’re here just for the craic, in which case dive straight in) if that’s not your thing, as the Georgian buildings, cafes and restaurants makes it worth a wander. From here, it’s an easy stroll to some of Dublin’s central landmarks that are worth a look. Explore St. Patrick’s cathedral with it’s formal gardens, St. Stephen’s Green (a centrepoint in Ireland’s political history) and the graceful quadrangle of Trinity College, Ireland’s oldest university. Grafton Street will lead you back towards Temple Bar along the city’s main thoroughfare, a busy shopping street with plenty of places to grab a coffee (or a doughnut at the Rolling Donut – you won’t be able to resist) if you need a bit of sustenance. If you’ve not had enough of pounding the pavements, head out of the centre and along the river. The docklands have seen substantial redevelopment over the last fifteen years, and striking modern offices and apartments jostle for space between renovated warehouses along the waterfront. Follow the northern bank of the river and pause for a moment to take in the famine memorial, a poignant reminder of a heart-breaking period in Ireland’s history. 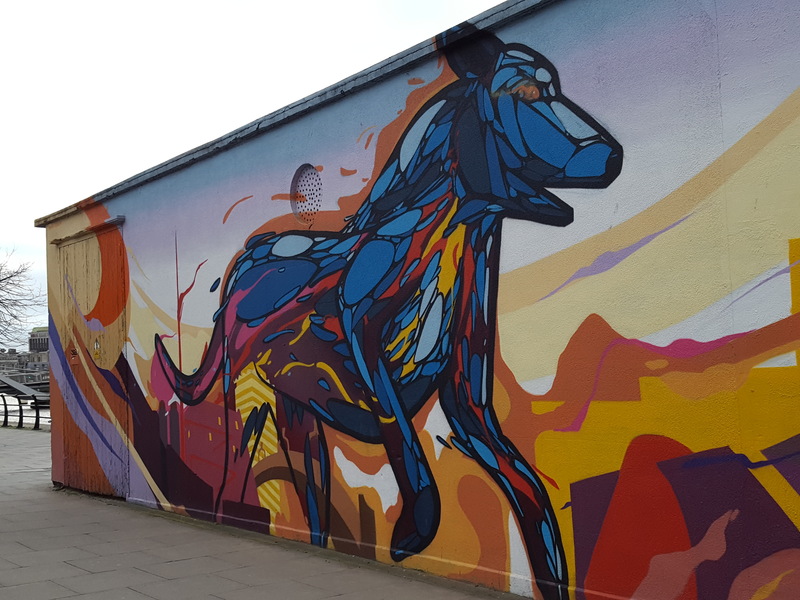 Cross over the eyecatching Sean O’Casey bridge and explore the Grand Canal basin, and keep your eyes peeled for some great murals along the way. Now, if you’re like us, you’re probably going to be pretty hungry by this time. It might seem tempting to head to Temple Bar or retreat somewhere close to your hotel if you’re after something to eat. But instead, go a little further south of the river to the area around St. Georges Street and George Street Arcade to find a cornucopia of cafes and restaurants. You’ll be spoilt for choice, because if there’s one thing Dublin knows how to do it’s amazing food. 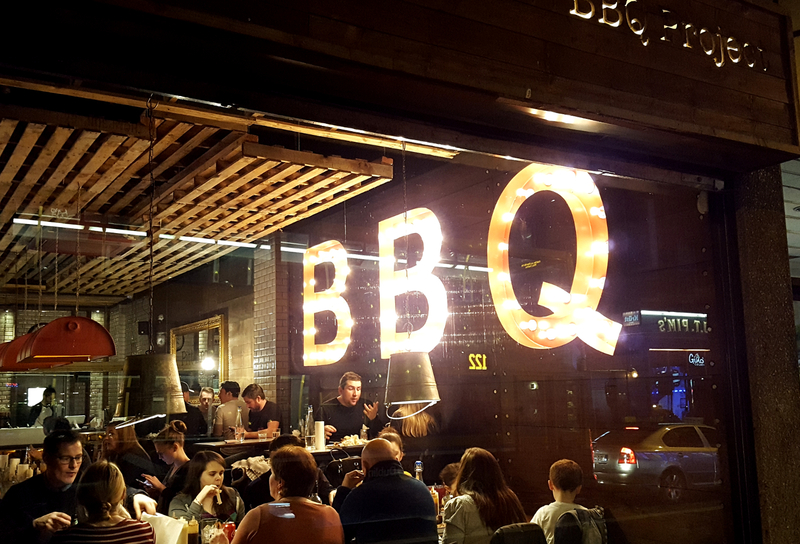 We made a beeline for the highly recommended, and highly recommendable, Pitt Bros BBQ. It’s one of those magic places that you know must be good, because you can’t reserve a table and service ends “when the meat runs out”. It’s a cracker of a restaurant, serving up barbecue favourites with succulent sides and an imaginative drinks menu. We opted to try the Pitt Bros. original ribs and the St. Louis ribs with a bucketload of sides, and tucked in for a feast. We loved it. And, as if it couldn’t get any better, once we finally finished our plates we got to go and help ourselves to a big old Mr Whippy from the in-house ice cream machine. What more could a girl want? After dinner, stroll the streets awhile to get feel for Dublin alive at night. Dublin castle is particularly picturesque lit up, but lets be honest. You’re going to want to head to a pub. We nipped into the Brazen Head, allegedly the city’s oldest pub, to nurse a pint by the fire. I hate to admit it but it felt a little packed full of tourists and lacking in atmosphere. So we embraced a little of Temple Bar spirit for the rest of night, ending up more through luck than judgement in the quirky Buskers on the ball. Walk through the doors and into the basement to discover it’s definitely not your average watering hole. Instead it’s quite wonderfully home to a vast number of table tennis, fussball and air hockey tables in place of your average bar furniture. Grab a drink, challenge your travelling companions to a game and enjoy – we thought it was great. We got going on day two with brunch at the Art Cafe, nestled under railway arches to the north of the river. A little way out from the centre it meant fantastic value for money, with hearty food and plentiful tea and coffee for less than €7 per head. Art Cafe features an ever-changing collection of works from local artists. But it doesn’t stop here. If you’re here on a Sunday morning like us, head over to Merrion Square for art by the armful. The railings around the outside of this pretty garden become an impromptu gallery once a week where local artists display prints and original pieces for sale. It’s a great way to see to see Dublin and the Irish landscape through the eyes of some wonderfully creative sorts. If the weather has got the better of you, don’t despair, explore the delightful Dublin City Gallery instead. Behind the picturesque Georgian townhouse facade you’ll find an impressive collection that includes stunning local works, Impressionist masterpieces and the Francis Bacon studio, dedicated to one of the city’s most famous sons. It’s also free of charge, so it’s a worthwhile trip even if you’re tight for time. With a full day to play with, take the opportunity to explore a little farther out from the city centre. Looking for a little splash of spring on a cloudy winters afternoon, we optimistically headed to the National Botanic Gardens, about 3 miles north of the river. Even when the weather’s not on your side you can potter to your hearts content around the graceful glasshouses, the sweeping lawns or explore the native woodland. 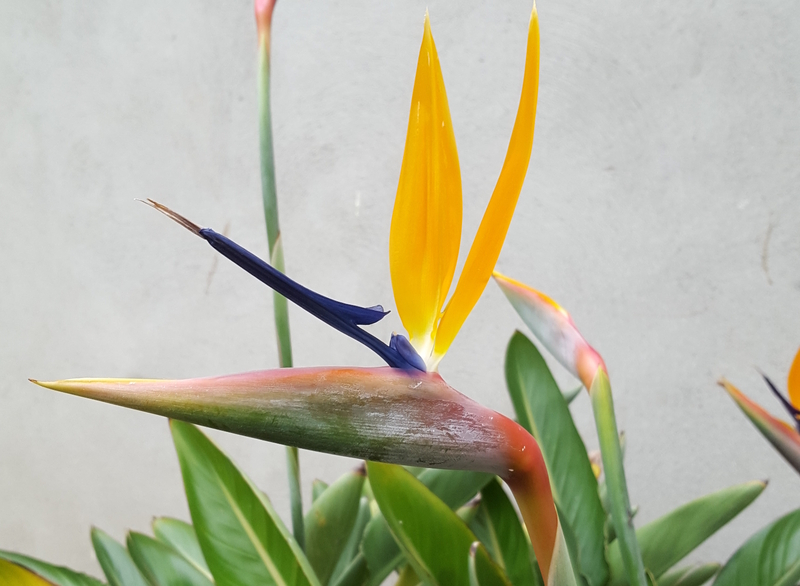 Look out for the collections of tropical plants and orchids on a grey day, or warm up with a brew in the cafe just inside the gates. The palm houses were great (and a good place to warm up!). Having trekked a fair few miles over the course of the day (we walked to the Botanic Gardens, which I wouldn’t recommend unless you’re feeling pretty intrepid. There’s helpfully a bus that will do the hard work for you), we decided that we’d earned ourselves some afternoon tea. 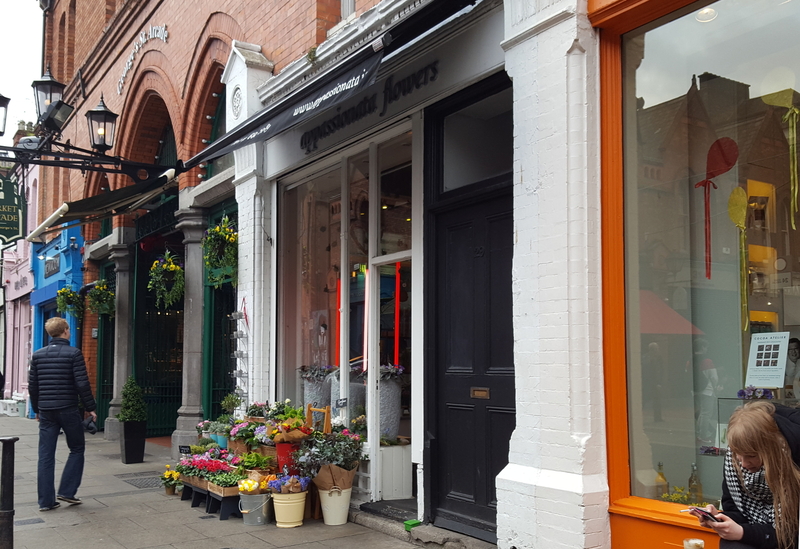 Brother Hubbard was a chance to get to know Capel Street, with it’s brightly coloured buildings and eclectic mix of shops. Pop in for a ganache hot chocolate (yup, that tastes as good as it sounds) and stay for what might be the best scones known to man. It might be a little on the upmarket side, but the cosy atmosphere and fabulous aromas make it worth the while. We meandered back into the thick of things as darkness started to fall. Close to George Street Arcade you’ll find Jo’Burger, the sort of place dreams are made of after a long day on your feet. We retreated into the warmth to fill ourselves with juicy burgers topped with magical combinations: mushroom, cheese and bacon for Mr Ben, sweet beetroot and horseradish for me. Oh, and trust me when I say try the lemonade. Their home-made citrus-y combinations are ridiculously good, and the lime and ginger was winner for us. All in all, another thoroughly recommendable spot to eat that promised and delivered delicious food. To finish off our day, we had one of life’s lucky moments. There are plenty of things we plan when we travel, and plenty that we don’t. Sometimes we just go for a wander and see what we find. Fancying an after-dinner drink we found ourselves in the Stags Head in Temple Bar, a stunning building with an old fashioned bar and stained glass windows. This in itself made it a good find. What we hadn’t banked on was discovering that they host free stand-up comedy gigs every Sunday, Monday and Tuesday night in their basement. One thing led to another (or one drink led to another, something like that) and we ended up spending our evening with a front row seat for some of Ireland’s best comedians. I couldn’t recommend it enough. We laughed, drank, laughed even more, and somehow managed to get a free ice cream, again. If you’re in Dublin don’t miss The Comedy Crunch, it’s wonderful! We wanted to venture a little way out of the city on our last day. 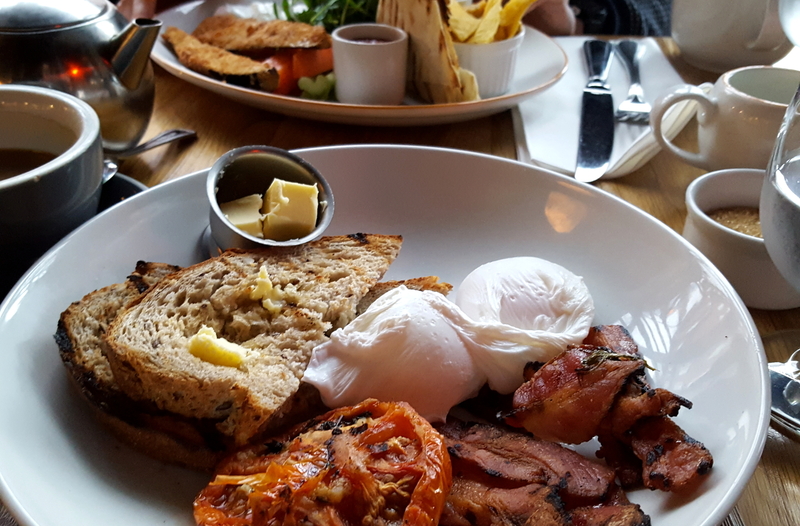 As with any good plan, it started with a good breakfast – this time at The Woollen Mills, close to Ha’Penny Bridge. 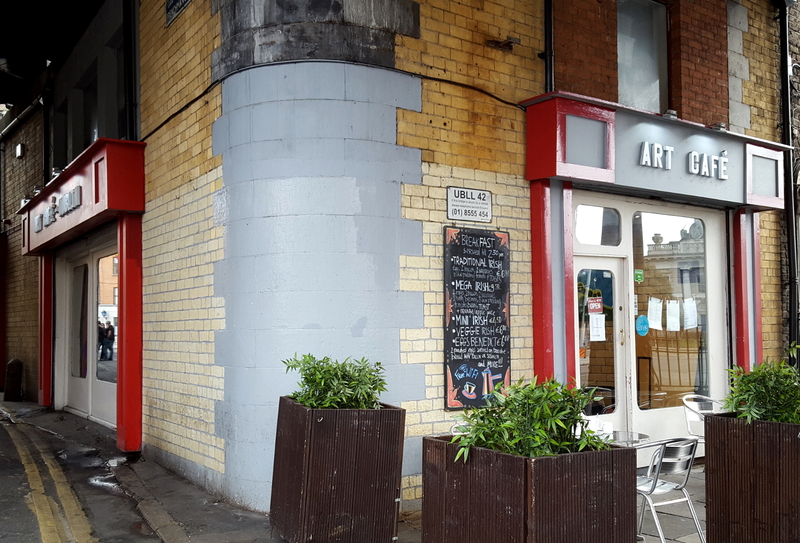 This cafe is a Dublin institution, even if it’s hipster interior belies it. We tucked into huge plates of delicious food over a morning cuppa and watched the world go by outside. Suitably filled, we headed to Tara Street station and hopped on a train to Howth. 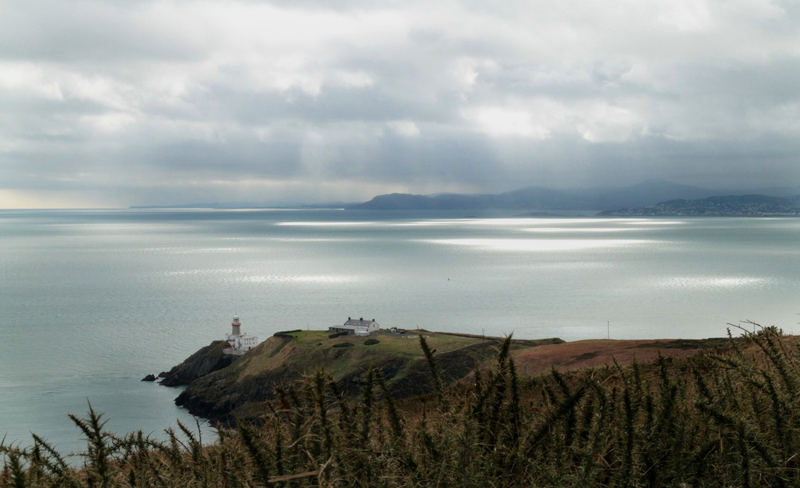 Less than half an hour away from the city centre, Howth is a pretty fishing village perched on a windswept peninsula, looking out across the Irish Sea. Dubliners love this place and it’s not hard to see why. The colourful terraced houses, restored waterfront warehouses now home to fish restaurants and oyster bars, the views across to water to the pretty little offshore island of Ireland’s Eye: it’s everything you’d hope to find by the sea. Happily, there are miles and miles of coastal path leading to, from and around Howth. We spent a pleasant, if a little windy, couple of hours exploring the coastline and taking in the views across the water. Contented after a few hours of walking, we warmed ourselves up with chips on the seafront before returning to the quaint little station. If you can squeeze in time, make sure that you’ve explored the area around St. Georges Street by day before you leave. 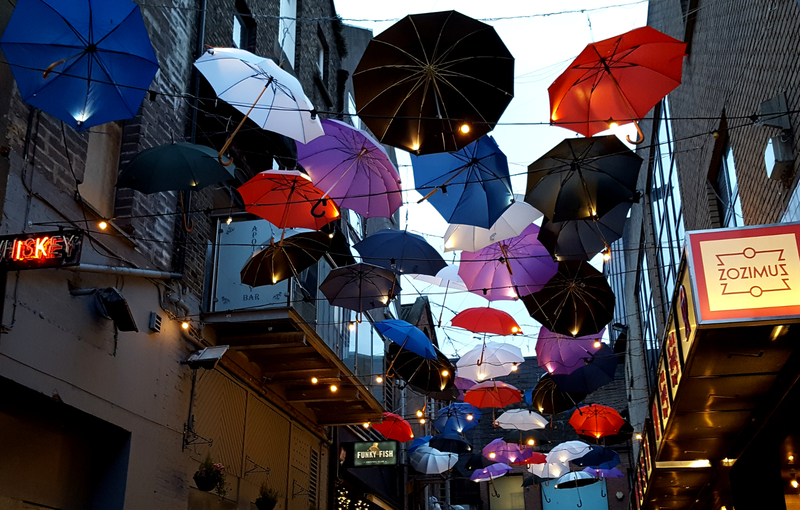 Georges Street Arcade is a fabulous brick and iron structure packed with quirky shops and market stalls and some fantastic places to grab a bite to eat. We stopped at Lolly And Cooks for homemade takeaway hotpot (divine) and to gaze longingly at their sweet treats, a happy end to a happy trip. Have you visited Dublin? What are your favourite things to get up to in this vibrant city? We flew to Dublin with Ryanair in February for less than £30 per person – proof that great value flights are out there! From Dublin airport it’s an easy bus ride on the Airlink Express into the heart of things. A return ticket cost €10 and appears to be open-ended. Normally, I’d let you know where we stayed – but we didn’t love the place so it doesn’t feel right. Don’t get me wrong, it was a comfortable enough roof over our heads, but I’d love to hear your suggestions if you’ve visited Dublin and found somewhere great to stay. Hotel? Hostel? What would you recommend? What a great weekend you guys had!! I’ll definitely be checking out the comedy club. Wish I had time to follow in your steps to Howth, it looks so lovely!